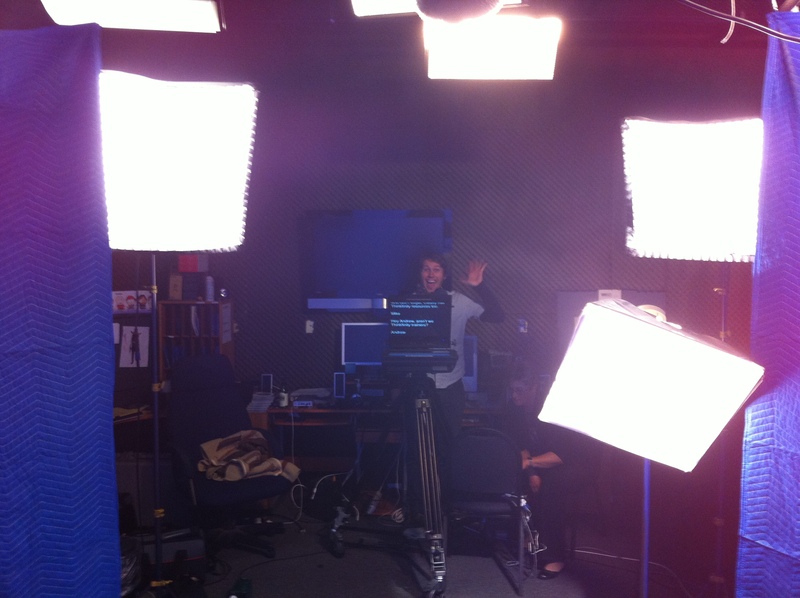 Videos, Scripts and Teleprompters – Oh My! November was video month for me. I worked on a grant from the K12HSN with Danny Silva, Mike Magboo and our local County Office of Education creating professional development videos for teachers. The goal of the videos is to help teachers take their classes online using Calaxy and Moodle. Making the videos was a fun experience. We shot 20 in all with another 10 still to be produced. I learned a lot in this initial process, like how something may sound good read from a page but saying it out loud sounds totally wrong. I also learned that memorizing lines is way harder than reading off a teleprompter. We didn’t get the teleprompter until the afternoon on day one. The people at METV were great throughout the whole process but I think they realized pretty quick that we were never going to finish on time if we had to memorize all those scripts. Due to time constraints in production we’ve only got rough edits right now. The first of which is embedded below. The complete series of videos with full effects should be done by the end of next week.